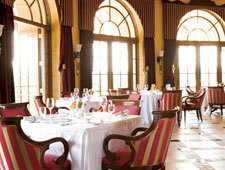 The stately, manor-like ambience at the restaurant of the palatial The Grand Del Mar resort is complemented by golf course views and a prominent wine room, which offers diners a peak into the extensive collection on offer. Chef William Bradley's contemporary French cooking is straightforward, effectively refined but intensely flavorful. Diners can mix and match multi-course prix-fixe selections or opt to just let the chef guide them through a spontaneous seasonal tasting experience.